As bacterial model, the PIMs team is expert in the study of the virulence of Bacillus cereus (Bc) and its mechanisms of resistance to the host immune system (38 publications, 1 patent). Bc is the second agent causing collective food poisoning and is also responsible for severe clinical infections such as sepsis and meningitis. Bc is able to destroy the intestinal barrier and enter the bloodstream. 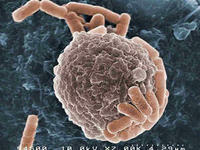 Thus, after ingestion or during infection by injury, the bacterium enters in contact with immune cells. The bacterium then resists the bactericidal properties of macrophages, in particular by surviving the nitrogen response. But this induced host immune response may be deleterious for the surrounding microbiota and contributes to the pathogenesis and spread of Bc. The goal of the team is to analyze the impact of the host immune response on the virulence of pathogenic bacteria in their biotic environment, taking into account the microbiota of the host. The innate immune response is characterized by the production of toxic substances such as oxygen and nitrogen derivatives. These compounds have a toxic effect against pathogens but also against the host and potentially also against its microbiota. However, there is little data on the impact of this response on the pathophysiology of pathogen / microbiota / host interactions. The objective of the team is therefore to study on one hand the effects of the immune response on pathogenic bacteria, and on the other hand to characterize the impact of the microbiota on the modulation of the host response and the development of pathogen infectivity. Our aim is to identify bacterial factors involved in the passage through the intestinal epithelium of the host and characterize the strategies developed by bacteria belonging to the group B. cereus, to resist and adapt to the innate immune response during the early stages of infection. i) Adhesion and cytotoxicity to eukaryotic epithelial cells. ii) Interaction with phagocytic macrophage-like cells. iv) Resistance to the oxidative and nitrogen response. Adhesion of B. cereus to an HeLa cell. To allow an efficient use of antibiotics, an accurate diagnostic needs to be performed. Our team tackles this issue by searching for specific biomarkers of food-borne pathogens. These biomarkers will be used to propose a diagnostic kit for food industries, lactarium and hospitals. Antibiotics have drastically reduced the mortality associated with infectious diseases. However, their overuse prompted bacteria to develop resistance. Since 40 years, the rate of discovery of new antibiotics has constantly decreased and no “first in class” antibiotic has been proposed. Meanwhile, drug-resistant bacteria have spread, leading to 23000 deaths/year in the EU. We identified an innovative therapeutic target for the development of new drugs. This target is a bacteria-specific protein with a key role in resistance to the host immune response. We identified inhibitors of this target able to specifically block bacterial survival during immune stress in vivo. These promising drug candidates are currently tested for safety to the host and for activity against serious threat pathogens. The innate immune response produces toxic substances to fight pathogens. However, these substances can also be deleterious for the host and its microbiota. 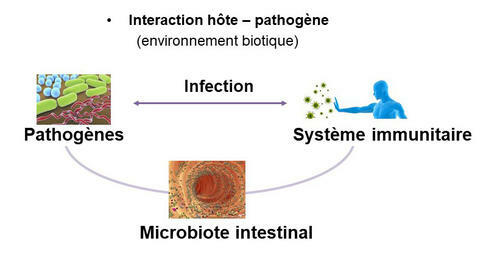 Using Omic analysis and appropriate in vivo models, we study the impact of the innate immune response on the virulence of digestive pathogens and on the intestinal microbiota, and in return characterize the impact of the microbiota on the modulation of the host response and on bacterialpathogenicity. The study of this “ménage à trois” -host/pathogen/microbiota- may allow identifying new biomarkers for better diagnosis of infections and inflammatory diseases. 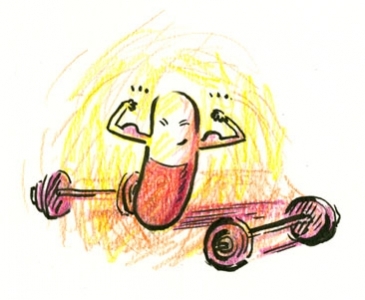 Last but not least, we set up a blog (https://bd-bacterie.com) and a multi-media comic to communicate with the general public on the use of antibiotics and on our current research.